Heading off somewhere to ride trails of an unknown quality is a roll of the dice, but in my opinion it's a no-lose situation: you either discover a new riding area that rules, or you come home with a newfound appreciation for your local trails. Sometimes both. When we were asked to participate in this year's Maxxis Media Camp, I was already stoked to go before I had been assured the trails would be awesome and, frankly, a tire person should know, so I didn't doubt Bobby Brown when he said they were excited for us to come and ride the trails at Mulberry Gap, 145 km north of Atlanta, Georgia. By the end of the weekend, I knew what I already knew - the tire guy was right. This was the first time I've ever been to a media camp that did not feature a product launch. Sorry to disappoint, but there are no new tires to talk about (Maxxis has released some new sizes recently, but all in tread patterns you've seen before). Maxxis' reason for inviting us along was to try some tires and talk about their technologies and design methods in a casual format. Riding came first, tech talk second. Honestly. It was refreshing. We learned stuff, but we spent more time deciding which Terrapin IPA to try than looking at Powerpoint slides. Their engineers only spoke for 15 minutes at a time. Most mountain bikers have attention spans that only last long enough to make cinnamon toast, so it worked out well. That doesn't mean we didn't learn anything, though. We knew all of this going in but that didn't cure me of my excitement. For a BC boy, Georgia feels like a fairly exotic destination - at least within North America. It is the far side of the south end of this continent, and of course, things are a bit different down there. The bite marks in my tongue were caused by our airport shuttle driver's ludicrous assertions about "the sketchy mainstream media", and other opinions best left unspoken were an early reminder that I'd be best off not talking politics for a few days. Actually, other than that unpleasant car ride, every personal encounter on the trip was downright civil and rational. Once we arrived at Mulberry Gap, though, all of that was left far behind. They have cultivated a casual, fun atmosphere, and it is certainly a destination set up to cater to riders. Small cabins accommodate riders in bunk beds with space heaters. If you prefer a nylon roof, you can pitch a tent at a site with a fire pit. Hot showers are placed between the place you slept and the tasty hot coffee that makes you feel ok about your 5 hour sleep and jet lag. A few hot tubs sit ready and waiting. Bikes hang on hooks from cabin eaves, or are leaned up against railings, waiting for their next call of duty. This is not just a Georgia thing. In the last year I have ridden past handfuls of shells in Oregon, Washington, and the Yukon. But I found this within 60 seconds of the drop-off at the top of our first run. The next day, Dave decided it would only be fair to take this shot, too. That behaviour doesn't fly on Mount Seymour but it was good fun on the trails of Northwestern Georgia. I saddled up a Switchblade on the first day, set up as a 29er with High Roller II's front and back. That is one of my all-time favourite tire combinations for winter shore conditions, but I haven't run it lately since I find the HR II to be a bit slow for long fire road climbs on the back - and it wears quickly. On the fast and smooth trails of the Pinhoti network, however, the 29 x 2.3 3C EXO Maxx Terras were terrific. Admittedly more rear tread than I needed on the hard-packed corners of Pinhoti 2, but after lunch, we headed to Bear Creek which had a lot more variety, including plenty of fast, loose corners which were prime High Roller territory. There aren't enough trails on the North Shore where you can set the tire on edge and hold a long turn at speed, so it was refreshing to get comfortable on the side knobs and feel the bike find and hold a line. For its part, the Pivot Switchblade was the perfect bike for the day. It may even have been a bit of overkill given its impressive capabilities, but it didn't feel sluggish or overbuilt for the trails of the day. Instead, if you stomped on it, it would reward you with a burst of speed, and the rest of the time I greatly enjoyed loading it up and springing over water bars or coming into some of the wide, blind corners just a bit hot and hoping it wouldn't go too smoothly. That behaviour doesn't fly on Mount Seymour but it was good fun on the trails of Northwestern Georgia. Safe to say I am eager to try a Switchblade when it arrives (*cough*Pivot!). On day 2 we switched up bikes and rode a zone called Mountaintown. More single and doubletrack through deciduous forest, with lots of fallen leaves to keep the corners unpredictable and hide the roots and rocky holes that wanted to swallow you. Peppered with jumps and creek crossings, it was an entertaining segment. I rode a Mach 6 setup with Minions (DHF/DHR II) which is a perennial favourite. For sure THAT was too much bike for those trails but I wasn't complaining - I was too busy trying not to eat it during the high-speed creek crossings over slick rocks. Back for lunch, then more riding. We had already all opted out of the night ride the day before, having succumbed to the amazing dinner and a few IPAs. Night two worked out the same, except the pump track shenanigans got going in earnest. Multiple fire pits (one serving as the gap between take-off and landing), trackside seating, a rogue bottle of bourbon, and many, many empties later, it's safe to say we would have been heard a long way off if anyone had been there. Mulberry Gap is remote enough that no banjo joke was made without a trace of realism creeping in. So it was the perfect place to teach a few more newbies the art of the thumbgun. Maxxis brought a lot of staff out to the media summit, from their US and TW offices. Ryan Huang is shown here teasing me about future tire designs. I'm sworn to secrecy. On the morning of day one, we hit the Pinhoti Trail, which is divided into sections. This one is called P2. It was a good way to get into the swing of things. Twice. With no new models to present, you might wonder why Maxxis wanted us all there. Their reputation is already locked down as a premier player, particularly in the Trail/AM and DH segments. The chill environment and low-key presentations belied a quiet confidence. Maxxis have been a leader for many years and the camp just served as a way to remind us that they understand the business of tires and value the chance to talk about their technologies. I have deliberately stayed away from digging into all that stuff, because it will inform later tire reviews. However, I will say this: after several disappointing experiences with plus tires, the 27.5 x 2.8" Minion DHF and DHR II I'm currently running on the Chromag Primer are turning out to be very impressive. The 2.6" Minions I rode on day 2 in Mulberry Gap were equally fun. I enjoyed the 2.3 x 29" tires even more the day before (they cut through the leaves better and were more playful) but the point is that Maxxis have been quite quick to respond to changing rim sizing and are bringing their popular treads in a huge variety of sizes and compound and casing options. If you had dismissed plus-sized tires, you may need to revisit them. If you haven't tried them yet, I encourage you to do so. Maxxis isn't the only brand making big strides in this area, but they are continuing to protect their position as a leader. With that said, I did have a question for Maxxis: asking on behalf of North Shore riders (and our ilk), meaning "we ride on terrain that demands aggressive treads and solid casings, but we like to pedal to the trailhead whenever possible", I asked: "can you comment on the relative rolling resistance of High Roller II, Minion DHF and DHR, and Aggressor? Caveats: 1) all things being equal; 2) on hard terrain like pavement, gravel, or hardpacked dirt. Probably not a surprise that they didn't want to give an answer. I persisted. No luck. But Bobby Brown, Maxxis' marketing manager, did drop a few pearls on me via email a few days later, and I think it would be only fair to share them. And actually, he did kind of create a rolling resistance hierarchy, with some terrific detail. 1. Griffin – Full height knobs with heavy ramping makes this tire roll really quickly. The full ramping does affect the climbing ability of the tire and it has a tendency to fall into a controlled spin when climbing. Some of our pro riders have found themselves overshooting landings on the way down due to how much faster this tire rolls. Not normally recommended as a front tire but a great rear tire when paired with a DHF. Richie Rude’s dry race combo of choice is a Griffin the back and a DHF in the front if there is a significant amount of hardpack on the course. 2. Aggressor – Full height knobs with enough knob density down the center for smooth rolling without the need for ramping. As such this tire climbs and brakes very well in intermediate terrain but the knob density does make for a mud-packed tire if you have sticky peanut butter mud. Watery mud tends to clear easily in my experience (most of our mud is like elementary school clay down here). Most commonly used as a fast-rolling rear tire with something more aggressive up front. That may change with the upcoming 27.5 x 2.50WT and 29 x 2.50WT models coming this summer. 3. Minion DHF – The gold standard. Not sure what else there is to say about the DHF, it’s won more World Cups than any other tire on the circuit and continues to stay relevant in DH, FR, and Enduro, even amid a crowd of copies. 4. Minion DHRII – The DHRII opens up the knob spacing down the middle and features paddle-like tread blocks that serve two main purposes: increased climbing traction and increased braking control. The open pattern allows each knob to better penetrate loose terrain and the paddle blocks increase braking control in steep and loose terrain where riders require a delicate balance of front to back braking. It literally gives you more braking power from the rear tire in the steepest conditions but trades off a bit of rolling efficiency in the process. A lot of our DH racers like the DHRII on both ends since it lets them brake harder, later. 5. High Roller II – The High Roller II is the most open pattern of the tires you named which also makes it the slowest rolling on harder terrain. In looser terrain, the rolling efficiency of the HRII get closer to that of the Minion line and may help just because it will keep driving you forward when either of those may spin out. In terms of cornering grip, the HRII is comparable to the Minion but favors wetter and looser terrain compared to the DHF which is better in intermediate and loose-over-hard situations. The supported sideknobs of the Minion line have a lot to do with this difference as the HRII knobs tend to fold before the rubber slides when cornering aggressively in hardpack terrain. There you have it. Mine those nuggets, tire nerds. Bobby was quick to remind me that they don't have numbers to support those points - think of them as very, very informed opinions - but that's still very useful information. He also pointed out that tire selection is as much about feel and confidence as it is about lab results, and of course that makes perfect sense. Maxxis sat us down for 4 product presentations, but each one came after we'd eaten, and each one lasted only 15 minutes. Perfect. The crew at Mulberry Gap have the MTB destination lodge operation dialed. Shuttles are there if you want them, the amenities perfectly straddle the line between rustic and comfortable, and the food is plentiful and very good. Dylan Stucki pounded the pump track hard. Mike Kazimer put in quite a few laps as well. I probably wouldn't get in a plane and fly 10-12 hours down to Georgia for the riding alone. The trails were fantastic, don't get me wrong, (Pinhoti is an IMBA Epic Ride) but it's a long way to go unless you're stringing a few things together for an epic experience. The Pinhoti Trail comprises about 170 miles in each of Georgia and Alabama, and it would be a great bikepack route to undertake. I would also want to spend a little time in Atlanta and hell, you're also in spitting distance of Tennessee. If you live a little closer to Georgia, or are in the area, I can't recommend Mulberry Gap highly enough. They welcome daily visits as well, so you can pop in for trail beta and a sneaky shuttle, and stop off after for a shower and a Terrapin. As for Maxxis? Still one of the best, and confident enough in it that they don't need to use hyperbole and fireworks to convince anyone. We'll have more thoughts about some of their newer models soon, like Aggressor DD, and the aforementioned plus-sized Minions. Cooper Quinn - April 6, 2017, 2:36 p.m.
"145 km north of Atlanta, Georgia", said no one in Georgia, ever. Dave Smith - April 6, 2017, 2:55 p.m. Strangers in a strange Trumpy land we were. natbrown - April 6, 2017, 5:40 p.m.
Did someone say nerd? Here I am. I'm not all surprised at the hierarchy of rolling speed given by Bobby, but it's awesome that he passed that info on. As he alluded to rolling speed principly comes down to openness and ramping, compound aside. As for the point about lab results, they're only useful if they're interpreted correctly. They can provide explanations of why tyres feel good or bad, that can then be used with unfamiliar tyres to test the interpretation. If it fails that, throw the interpretation out. Bahhh, who am I kidding, no one is going to care about this. This was a really good article Pete. Particularly so in the context of it being a press event. Pete Roggeman - April 10, 2017, 7:01 a.m. Thanks, Nat. That info was hard won, so I'm glad it was appreciated. And I understand why they were reticent to let too much get out there, but on the other hand, I knew a bunch of people would be interested - because I sure was. Tehllama42 - April 8, 2017, 7:49 p.m. I'm still excited about silly things like a 2.4WT Minion-SS DD Casing (provided that the side knobs aren't dragging constantly with 30mm IW rims). I'd be really curious how much the rubber compound plays a role in some of that - e.g. would a 42a/50a/60a 3C DHF still roll as well a 50a/60a DC HighRoller or DHR2. I can feel a fair bit of these differences on my own, but without the ability to run each variant of a tire, or run stuff back to back, I feel that some of their feedback would be phenomenal. 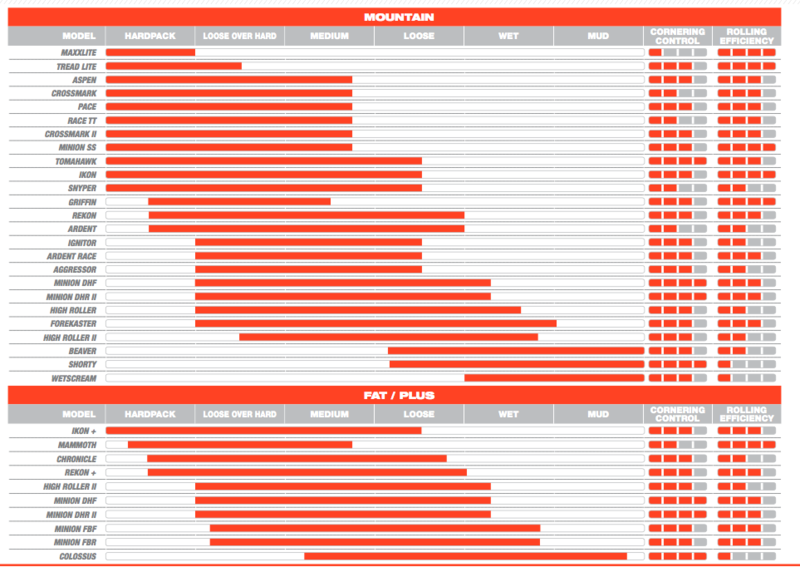 In short: I'd say that Maxxis has a great portfolio of tires, and it's only getting better (with 2.6" widths coming in for popular tires), and some great new tread designs (Forekaster, Aggressor, Rekon, Ardent Race are among my favorites)... but the only area they might struggle with is how to better inform consumers about what tire is really going to be best for them. 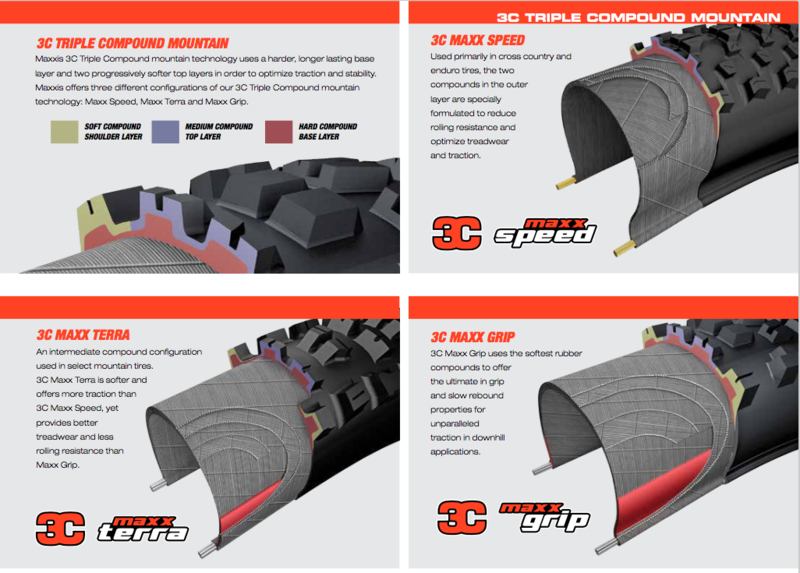 I don't think I'm alone in saying that for each application, Maxxis makes a tire that is one of the best three available - but often a different Maxxis option gets bought and that's why the results are mixed [or riders just default to DHF's, because short of a pure XC course they're never bad]. Pete Roggeman - April 10, 2017, 7:15 a.m.
Agleck7 - April 12, 2017, 1:43 p.m.